Earl Grey tea was named in honour of politician and aristocrat Charles Grey who was the 2nd Earl Grey of what was the very important Grey family line. Charles Grey was England’s Prime Minister from 1830 to 1834. During this time the story is told, that he brought what we know as Earl Grey tea to the world. He achieved putting this very special tea blend on the map, by sharing it with none other than Queen Victoria at the time. It was the Queen’s instant love for this tea that had Earl Grey tea marketed to the rest of London, England and eventually the world. So how did a politician acquire such a rare and special tea? The simple answer…it was a gift. Legend has it that he was given a gift from a Chinese mandarin who had given this gift in gratitude of the rescue of his son by one of Charles Grey’s soldiers abroad. The tea was first presented to the Earl in 1803. 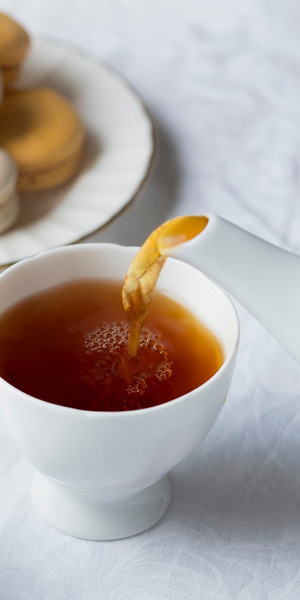 Earl Grey was essentially a black Chinese tea, but what made this tea so special was its infusion and combination of the black tea with Bergamot oil. This oil is a product of a hybrid tree which is a mix of both sweet lime and bitter orange; a Bergamot orange tree. Although we believe that this combination creates the perfect blend, it was once rumoured that the Bergamot oil was actually added to get rid of the ‘lime’ taste in London’s water. Although most would believe the connections of Charles Grey to the origin of Earl Grey tea, others might be aware that there were actually no records to exist that Charles Grey ever visited China, then proving that there was no gift or link to the mysterious China mandarin. Later studies by the Oxford English Dictionary hypothesized that Earl Grey tea actually commenced quite after the demise of Sir Charles Grey. Another discovery came about, that London tea merchant, William Grey was the legitimate entrepreneur who brought Earl Grey to the Western world. Eventually we know for sure British-based Jacksons of Piccadilly was one of the first tea companies to produce the bergamot- scented tea under the name ‘Earl Grey’s mixture’. Later Charlton & Co and Twining’s of London also marketed a similar version of Earl Grey. Today there is a wide variety of Earl Grey blends available, some contain Lavender like our Red Leaf Tea’s Lavender Earl Grey blend, and then there are some variant’s know as Lady Grey which include Lemon and Seville orange peel in addition to the original Bergamot oil.